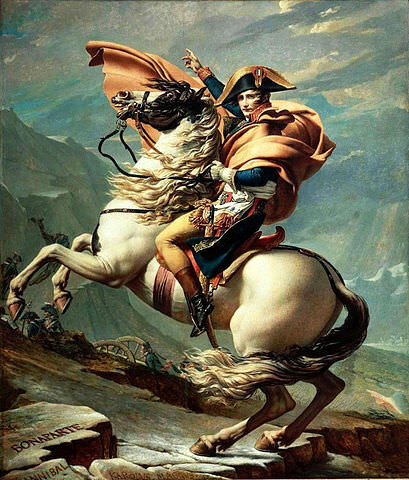 Napoleon didn’t say an army travels on its stomach, and he didn’t cross the Alps on a horse. Napoleon is one of the most quoted people in history, and thus also one of the most misquoted. Here are 10 supposed Napoleon Bonaparte quotes that did not originate with him. 1. God always favours the big battalions. 2. An army travels on its stomach. 3. No plan survives contact with the enemy. 4. Able was I ere I saw Elba. This well-known palindrome first appeared in an American periodical called The Gazette of the Union, Golden Rule and Odd-Fellows’ Family Companion on July 8, 1848, 27 years after Napoleon’s death. According to the article, the editor’s friend, one “J.T.R.” was trying to outdo the palindromes of a “water poet” named Taylor, and came up with the above, as well as “Snug & raw was I ere I saw war & guns.” The paper went on to challenge its readers to “produce lines of equal ingenuity of arrangement with the same amount of sense.” (4) For details of how this quote became attributed to Napoleon, see The Quote Investigator. 5. I gave them a whiff of grapeshot. 6. Never ascribe to malice that which is adequately explained by incompetence. 7. A constitution should be short and obscure. 8. An army of sheep, led by a lion, is better than an army of lions, led by a sheep. This quote is attributed to many people, going as far back as Alexander the Great. 9. England is a nation of shopkeepers. 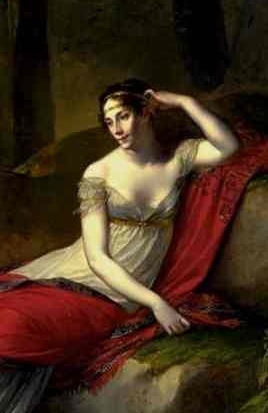 Did Napoleon tell Josephine “Not tonight”? We’ll never know. Not being privy to all of his bedroom utterances, we’ll never know whether Napoleon actually said this to his wife. There is, however, no evidence that he did. The phrase originated in the early 20th century. See The Phrase Finder. For phrases that did originate with Napoleon, see my post about 10 Napoleon Bonaparte quotes in context. 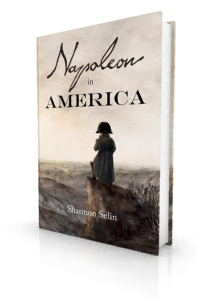 Napoleon’s dialogue in Napoleon in America is a mix of adapted quotations and invention. Ralph Keyes, The Quote Verifier: Who Said What, Where and When (New York, 2006), p. 79. Thomas Carlyle, The Works of Thomas Carlyle, Vol. IV (London, 1903), p. 314. Johann Wolfgang von Goethe, The Sorrows of Young Werther (London and Boston, 1891), p. 1. 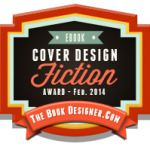 Jane West, The Loyalists: An Historical Novel, Vol. 2 (Boston, 1813), p. 134. Pierre Louis Roederer, Oeuvres, Vol. III (Paris, 1854), p. 428. Adam Smith, An Inquiry into the Nature and Causes of the Wealth of Nations, Vol. 2 (London, 1778), p. 223. Josiah Tucker, A Letter from a Merchant in London to his Nephew in North America (London, 1766), p. 46. Thanks for setting the record straight Shannon. Very interesting. Thanks, Susan. Glad you enjoyed it. If memory serves, it was Lord Nelson who originally was quoted as having said of his command, “The Fleet sails upon it’s stomach”. This was, I believe, just before he ordered his squadron to Aboukir to pursue rumours of the presence of the French fleet. Sadly, however, he first had to deal with the immediate problem of revictualling on a coast where virtually no ports were open to British ships, and those that were refused to support the war effort for fear that Bonaparte, who up until this point was adding one knotch after another to his Imperial Conquest cudgel, might come and knock them over the head as well. Ultimately, Nelson found support in the Three Kingdoms Of Sicily (Naples), and ergo made the acquaintance of the ambassador and his wife as well, Sir William & Lady Hamilton. Interesting. Thanks. I wonder how this remark (or its variant) wound up being attributed to Napoleon if Nelson was the one who actually said it. Actually, as far as an army marching on its stomach is concerned, never were truer words said and, ironically, it was Napoleon’s ultimate challenger the First Duke of Wellington, that, like the victualing convoys of the Royal Navy, performed near miracles (most of the time), in keeping enough food in the stomachs of soldiers, to prevent starvation, diseases and to enhance performance in the field. Bonaparte was not so efficient. This and his neglect of La Marine were two issues that ultimately, badly let him down. How true. Napoleon didn’t understand the limits of human beings, or the importance of logistics. Austrian army built “Magazines” for food storage at strategic points, accepting the demands of permanent warfare. Empress Marie Therese declared: “If we want to shear the sheep, we have to feed it.” Napoleon must have known this. His first campaigns were in Northern Italy, the proverbial horn of plenty. Not so in Russia. Wonderful quote, John. I hadn’t heard that one. Egypt was another place where Napoleon badly miscalculated the food and water situation. ‘England is a nation of shopkeepers.’ Though as you say the term may have originated with Adam Smith, I think it was Paoli, the Corsican leader and Napoleon’s mentor in the early years, who first directed it against the English, and perhaps unsurprisingly Napoleon was quite fond of repeating his quote. As regards ‘An army marches on its stomach,’ I think you and Michael Crumplin do Napoleon somewhat of a disservice; he would often eat only a soldier’s rations on campaign so that he knew what his men were capable of; and I certainly don’t think you can say he didn’t understand logistics. Unlike the Allies, he expected his army to live off the land. The scorched earth policy made this impossible in Russia. but supply depots were set up en route to Russia; unfortunately when the ragged army came back, it found the garrisons had broken into the depots and these supplies were much depleted, adding much to the general woe. That said, stories of bravery and sacrifice still emerged, which given their situation, seem quite astonishing. Thanks, Brian. Excellent point about the mismatch between Napoleon’s plan for logistics and the reality in Russia. There are a couple of articles about that here: http://www.napoleon-series.org/faq/c_russia.html and here: http://www.indiana.edu/~psource/PDF/Archive%20Articles/Spring2011/LynchBennettArticle.pdf. Thanks Shannon. A brief, but good reminder of the supply situation during the Russian campaign. I have read that the French policy of living off the land, that is, pillaging, made them very unpopular in the Peninsula, and so contributed to their defeat; whereas Wellington victualled his troops from allied resources and so retained the goodwill of the population. I don’t know how true this is. Mention the name ‘Marmont’ and you won’t get much sympathy from Bonapartists – and I would hope you know why. That doesn’t invalidate his complaint however or Geoffrey’s point. Yet, Napoleon’s policy of having his armies live off the land for the most part in the rest of Europe worked, didn’t it? No doubt it was unpopular elsewhere – and I would not think kindly of it myself were I on the receiving end – and one understands why it didn’t work in Russia. The reason why Spain was different as well though was because the British were there. So while this will have contributed as Geoffrey rightly says, it wasn’t I don’t think a major factor in creating the Spanish Ulcer. Indeed, by reducing the baggage train, Napoleon’s “live off the land” policy enabled the French army to march faster, thus contributing to many successes. And you’re right, there were other factors adding to the Spanish ulcer.